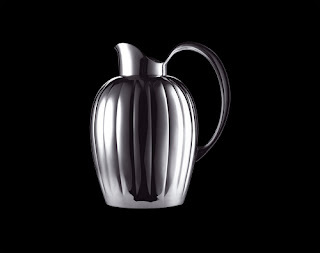 Sigvard Bernadotte, one of the first modernist designers at Georg Jensen, re-design of this silver pitcher was one of his last designs he did for Georg Jensen. It was developed into a thermos possessing the original form. The thermos was introduced shortly after the death of Bernadotte and its great success further emphasizes the quality and timelessness of his many brilliant designs.....cool.